The late E.L. Ahrons once described the North London Railway as ‘a sort of handmaiden to the London and North Western Railway’. It may have been at the time he wrote his masterly ‘The British Steam Railway Locomotive’, but it was not always so. Although born in the railway mania, the NLR does not seem to have been a product of it. Rather it was a genuine attempt by the East and West India Dock Company to improve its links with the industrial Midlands. Its first directors were mainly London businessmen with a few representatives of the Dock Company and the London and Birmingham Railway, but as the effects of the mania took hold, money became scarce, and the L&B agreed to help out in consideration of being allowed a 50% representation on the Board. Early relations with the other railways were always strained. Neither the LNWR nor its predecessor the L&B ever seemed too sure whether it wanted to work the line, lease it buy it or ignore it. Back in 1847, long before the line had been built, the L&B had proposed to use it as the first stage of its short lived, steeply graded and mainly tunnelled scheme to reach the City of London, but it was not until 1865 when the Broad Street line opened that this ambition was finally realised. The London and Blackwall who at first were keen to provide a passenger route into their City terminus at Fenchurch Street put every obstacle in its way once trains began running. Despite this, or perhaps because of it the NLR maintained a fierce independence, striking hard bargains with other railways who wished to use its route, and often playing one off against the other. It did not always tell the LNWR what it was up to, maybe assuming that their representatives would do so, maybe hoping that they would forget. It developed its own method of working, with block passenger trains lit by coal gas, highly standardised rolling stock and closely spaced signal boxes. On the other hand, it was not afraid to borrow ideas from the LNWR, adopting its permanent way, chain brake, and signals, each of course customised in some way or another. Its officers paid fact finding visits to Crewe and Wolverton fairly frequently to view the latest techniques. 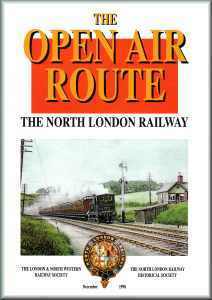 The North London Railway Historical Society has in some ways mirrored the NLR. We have a small membership of some 75 people, commensurate not with the size of the railway itself, but with the interest which was always shown in the NLR. Since our early days we have had reciprocal arrangements with the LNWRS, and recently have embarked on a similar relationship with the Great Eastern and Great Northern Railway Societies. This is our first attempt at a joint journal, and we hope its contents will show how the two railways developed separately, serving their own shareholders, whilst at the same time not ignoring each others needs. Let us hope our newly privatised railways can do the same!